Mounting a 21.5 inch LED Light Bar on the hood of a Jeep JK is made simple with the Motobilt brackets. Mounting a 21.5 inch LED Light Bar on the hood of a Jeep JK is made simple with the Motobilt brackets. The kit consists of a left and right bracket. 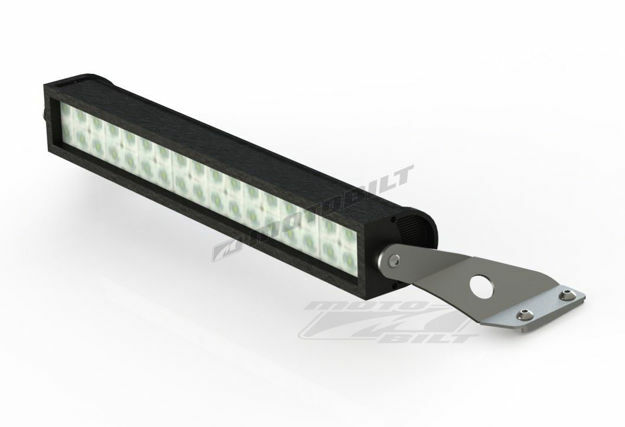 The brackets are designed to work with a LED light bar with a mounting width of 22-1/8". The brackets bolt to the hood hinge bolts. The brackets are shipped bare metal ready for you to paint or powdercoat the color of your choice. The brackets are fabricated from 1/8" steel plate. Designed for LED mounting width of 22-1/8"